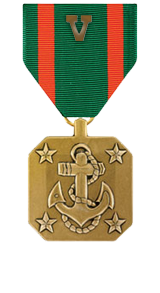 Heroic achievement in the superior performance of his duties while serving as Team Leader and Squad Leader, 1st Squad, 4th Platoon, Company K, 3d Battalion, 3d Marines, Regimental Combat Team-7, I Marine Expeditionary Force Forward, from March to September 2006 in support of Operation IRAQI FREEDOM. Assigned as a team leader at the commencement of combat operations, he assumed the responsibilities for his squad midway through the deployment with no disruption to the company’s operations. On 30 July 2006, his squad was subjected to an Anti-Iraqi Force small arms fire attack while conducting security operations in Haqlaniyah. He positively identified the enemy and fearlessly led his squad as they returned fire and maneuvered onto the Anti-Iraqi Force position. During a subsequent attack, he exposed himself to enemy fire in order to properly control the actions of his squad and to direct fire onto enemy positions. In both instances, his courage, leadership and decisive actions under fire, helped disrupt a determined enemy attack. Corporal Asay’s initiative, perseverance and total dedication to duty reflected credit upon him and were in keeping with the highest traditions of the Marine Corps and the United States Naval Service.